Can't attend? Follow Swapaholic to know of future events! 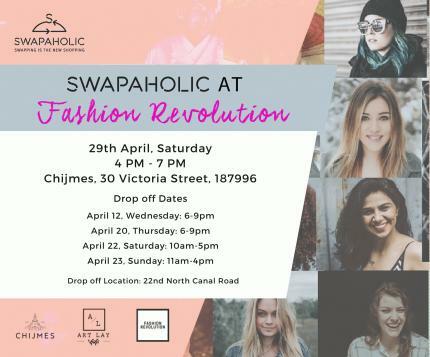 together to present to you, the ultimate CLOTHES SWAP event. them for items that you will actually love wearing! <> ARTIST AT WORK: We are working with insanely talented artist Gigi Wy Chow to create an ART PIECE to help us trace who really made our clothes as shout out of respect for the workers who enable us to look our best. <> PARTY DON’T STOP: We have the unbelievable DJ Nickey to play us irresistible tunes while you are swapping! Feel free to express your joy through singing and dancing along with her; swapping is meant to be therapeutic after all. <> YET ANOTHER GUILT-FREE TREAT! : Oh and finally - as a reward for your hard day of planet-friendly swapping, each SWAPAHOLIC will receive a guilt-free frozen treat, (100% natural with no added sugar or nasties) from HIC JUICE when you check out! <> SWAPPING MADE EASIER! : We are excited to launch our event page to help you SWAPAHOLIC have a more delightful and efficient experience! You can now register for events and drop off dates online and avoid queueing up! Watch our ‘HOW IT WORKS’ video here or read below! - Simply find the event at Swapaholicevents.com or on our Facebook or Instagram, and get ready! - Go through your closet and pull out those gorgeous clothes, shoes and accessories that you never wear. Please select only swapaliscious items that another swapaholics could enjoy. •	At this stage, you should also select a drop-off date, time & venue where you can drop off your items before the event. •	At these drop-off counters, our Swapaholic Police will quality check your items. •	After paying a nominal registration fee (CASH payment only), you'll receive a paperless coupon with your Swapling points (based on the styles and brands of the items you submit). -	Students & Seasoned Swapaholics : students and Swapaholics who attended the Earth Fest & Crib Event Receive $ 4 off when surrendering minimum 7items at any drop off date. • All items in must be in excellent condition - clean and wearable NOT stained, torn, faded, ripped, missing buttons, damaged, and broken zippers. All items will be inspected before acceptance into the swap pile. • Fashion items only for LADIES! • BYOB (Bring Your Own Bag!) Swapaholic doesn’t provide bags in an attempt to minimize waste. Fashion Revolution is a global movement in 90 countries that runs all year round. We have created a worldwide platform which we can all use to ask questions, raise standards and set an industry-wide example of what better looks like. CHIJMES is an award-winning gazette national monument recognized by UNESCO as an Asia Pacific Culture Heritage Conservation development with two historic buildings, Caldwell House and the CHIJMES Hall. A premier dining and entertainment establishment. HIC is about taking the leap forward. We are the rhythm and movement towards life’s lighter side. Life that’s simpler, healthier and happier. SWAPPING IS THE NEW SHOPPING. It for the green fashionista who isn’t afraid to be herself. It reduces waste, use of natural resources and tragic human impacts. So declutter and refill your wardrobe without hurting your wallet or the planet!